Radio stations need to re-tool themselves in order to really increase their billing against newspapers and television. Isn't it amazing that radio remains so popular with Baby Boomers and Generation X, while newspaper circulation and television HUT levels keep going down because of these generations? All of this has been caused by their mindset and lifestyle, which are completely different than any previous generation in American history. The billing for newspapers and television basically remains the same, which is the lion's share, while radio keeps getting the morsels of 8-10% of the national pie. Demographics serve only one purpose in market research. They tell you what gender you are, how much money you make, what products you buy, and how many times you do it. Using Genergraphics(tm) will tell you why people do what they do and how to get them to do it for you. 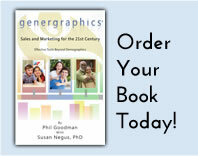 Genergraphics is the next step after psychographics; it tells you what effect and influence each generation has on the others in buying products and services. If you are a GSM of a radio station, you are probably saying to yourself, what does all of this have to do with increasing your billing? Plenty, I mean plenty. Radio needs to get into Genergraphics market research more deeply, especially in their local communities. You can do this with local businesses using your Web site. Radio has a stronger concentration of Boomers and Generation X'ers in its audience than the other media. You and I both know that radio is going to have to find a different way to increase its billing. Genergraphics ties in with your Web site to help your advertisers define which generation is the majority of their demographic profile. Example: Let's say that a local furniture store has a customer profile of people 25 to 54 years of age. There are three generations in this group-Boomers, Generation X and Echo Boomers. Radio stations can help that furniture store do surveys on their Web sites to tell them which generation is the majority of their clientele. You can use these surveys as an incentive for them to purchase more advertising on your radio stations. In all due respect, ad agencies will never abandon demographics and the CPM's that they measure your radio audience with. You need to do educational seminars for potential advertisers who never buy radio. I know for a fact that 99% of your potential advertisers don't realize how potent radio is compared to the newspapers when it comes to reaching Boomers and Generation X. The only way that radio is going to get more clients is to introduce Genergraphics to their advertising community as the real measuring stick of their audience. This is not to say you must abandon demographics. You still need to count numbers. However, numbers alone will never help you get your fair share of the local or national billing. Radio groups all over the country will need to accept and embrace Genergraphics or stay behind forever. What's really sad for radio is that demographics alone will never show the true value of their medium. Once you educate potential clients about this new method of research and how to apply it, then their ad agencies will fall in line.